I grew up enjoying the retro-adventure movies of the 1980s brought back to the silver screen by filmmakers such as George Lucas and Steven Spielberg. At the time, I was especially attracted to the romanticized archeology of their Indiana Jones films, depicting the hero and heroine in a frantic race to find lost treasures and bring them back to the museum before they could be stolen by tomb raiders and black marketeers. When I started to design board games, this was one of the first themes I tackled as Tikal was the only other game I knew on the subject at that time. (Mykerinos, Thebes, Pergamon, and The Adventurers had not yet been released.) Little did I know, the design of the game would turn out to be an adventure in itself, with as many surprising twists in the story as any blockbuster film. I wrote down my first ideas and made parts of a prototype as early as 2004. 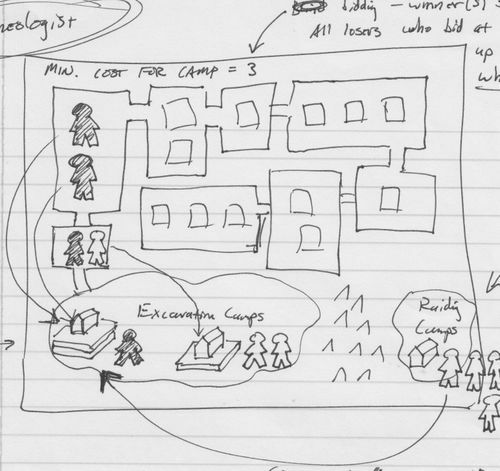 The main concept was that players would send teams of workers to four different continents in a race to uncover the most valuable artifacts, then ship them home before they could be stolen by one of the other players at the site. I had several "cavern tiles" that would be combined randomly at each site to show the paths and rooms that the workers needed to enter in order to find the artifacts. I had a set-collecting mechanism that allowed a player to produce exhibits of either one artifact type (pottery, sculpture, etc.) or one location (Asian exhibit, etc. ), and I came up with a mechanism that gave players more income for each exhibition they produced, but that also decreased the base income for all players. (The work of the archeologists is heavily subsidized in the beginning, but as the players begin to hold exhibits, they are increasingly expected to generate their own revenue for future digs.) Each exhibit also awarded a number of victory points, which would decide the winner of the game. These basic mechanisms survived years of development and are still a prominent part of the published game. Even so, these design elements desperately needed an original, central mechanism that could tie everything together. 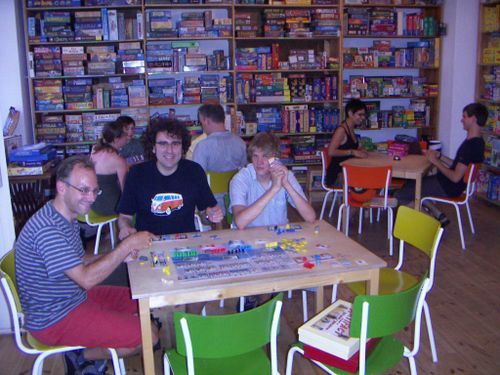 When Bernd Eisenstein moved to Berlin and joined our gaming group in early 2005, I found out that he, too, was a budding game designer, having won the Hippodice Game Design Competition on his first attempt. (His game was published as Maya from ABACUSSPIELE.) I had always wanted to try co-designing a game with someone and asked whether he would like to meet sometime to share unfinished prototype ideas. I hoped that together we might be able to help each other move a few of our game designs forward. We met a week later, and he showed me the beginnings of Zack und Pack. He also pulled out a racing game that didn't quite work but had an interesting market mechanism. I showed him Artifact, and he was intrigued enough to take the prototype home with him. At our next game night, Bernd brought a fully functioning prototype of Artifact with him. He had spliced in the market mechanism from the racing game he had shown me, and it worked much better in this context. The idea was that every action had an action track with markers in the color of that action, and that players started each round by taking markers for themselves. Each marker taken from the action track made the price for that action increase so that the actions most desired at that particular time became more expensive – but the cost of an action was not paid until a player took the action and replaced the action marker on the track. In this way, as players took actions, the costs of the actions would decrease. Thus, a player could pay top dollar for a popular action in order to beat the other players to a valuable find, or he could wait until the action was less expensive — but usually not as lucrative. We were excited to have this as the game's central mechanism as it was different than anything either of us had ever played before, and I've still not played anything quite like it. Bernd also revised my worker movement system of using chains of workers to search the caverns, and he stacked increasing numbers of artifacts on each tile so that going deeper into them was rewarded. He also balanced the victory points and income for each exhibit so that some types of exhibits would offer more income and fewer victory points, while the more difficult exhibits would offer more points and less income. Deciding when to switch a player's focus from income to victory points gave the game a nice "engine-building" feel. We knew from the start that this would be a more complex "gamers' game" and sent it to a publisher who produced those kinds of games. 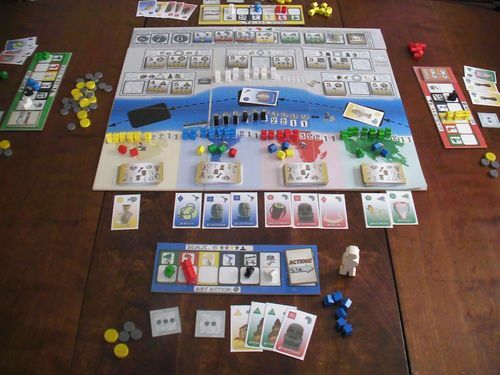 Furthermore, this publisher was always quick to playtest prototypes and give detailed feedback; within weeks, we had our prototype back with several suggestions for improvements. We made changes for many months, testing them, then sending the prototype back to the publisher, but it was always returned with requests for further adjustments. We finally looked at streamlining certain aspects of the design. The game had mounds of components with stacks of artifact chits piled high on top of changing room tiles and a game board full of action tracks covered with tokens. I decided to combine some actions so that only six different types of action markers existed rather than the original eight – and four of them were the workers one could hire on each of the four continents. We also changed the artifact tiles to cards and simplified how they were discovered: Players would now reveal a card for every worker hut built at the site after the first one. 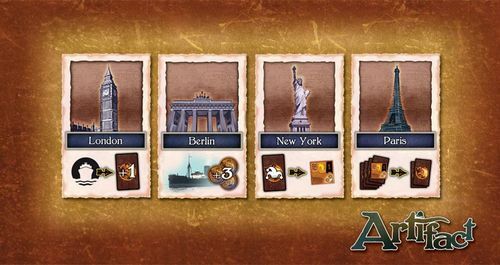 This small touch from Bernd also added tension in deciding when to ship artifacts back from the site as the last player to ship would wind up with one artifact card less, in addition to not having a broader selection of cards from which to choose. It also made reference to my original idea of allowing players to steal artifacts right out from under the nose of their opponents. As money was tight and the ship markers had only one action attached to them, I added a "black market" action so that players had the option of selling artifacts for cash when they were in a pinch. Any player could also buy one of the cards previously sold, and the ship market track determined the current price for buying and selling. This provided a much-needed boost for players who were not able to get their income-producing exhibits finished as quickly, although the exhibits were still a much better source of income and victory points. Besides, it continued the inside joke among our game designers' group that almost every prototype of mine has to have a black market! Finally, I redesigned the game board so that it better described the game's narrative. Although I still used only clip art and simple desktop publishing software, both Bernd and I have always felt that the graphic presentation of a prototype is important. First, it makes the rules of the game more intuitive, giving the players visual cues to the rules. Second, it helps immerse the playtesters in the game experience. And third, it gives the potential publisher and graphic artist an idea of how the game could look and function. In Artifact, our first game board had reflected the hierarchy of the game's elements, with the income and exhibits in the center and the sites placed around the edges. 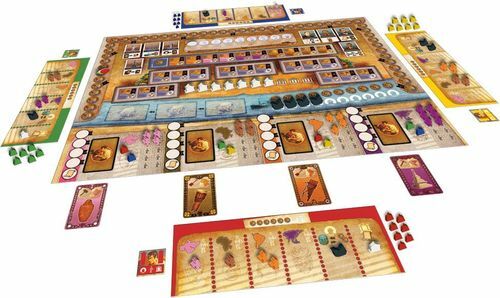 The new game board expressed the design from the perspective of the gameplay, reflecting the linear process of digging at various sites, then shipping (or dealing on the black market), and finally producing exhibits. After many successful playtests, I confidently packed the game into my bag to show the publisher at the annual Game Designer’s Convention in Göttingen. They were excited to see its progress and took the game with them for more testing. After several months of playtesting, we received a difficult critique: There was too much downtime as each player was able to take up to six actions per turn. Each player would also have only one turn per round, and determining the starting player for each round seemed arbitrary, although it was quite important. I decided to try the obvious and limit each player to 1-2 actions per turn. This worked surprisingly well and also opened the door to a solution to our starting player problem: The last player to pass on taking actions and bow out for the round would take the starting player marker for the next round. Players who passed early, however, could already begin refilling their action markers back to six, which made the actions more expensive again for those still in the round. This added some interesting tension to the simple decision of whether to take one action, two actions, or pass, and player turns were now quick with little downtime. Exhibiting the Findings: After overcoming all obstacles to recover the artifact, the explorers shake the dust of the wilderness from their leather bomber jackets and return to the bustling metropolis, donning coats and ties to meet with the rich and the powerful in order to bring their treasure to the public. I took the game with me to the Nürnberg Toy Fair to present one more time to the publisher. Finally, they were satisfied and took it with them to their main gaming event in another European country where the final selections would be made by the heads of the company. But several weeks later, we received the difficult news that it had been turned down...for the last time. Months passed, I submitted the game to another publisher who passed on it and I even sent the idea to an American publisher, who also passed because they had another archeology-themed game planned. I decided to send the game to Larry Levy and his D.C. Gamers group for blind playtesting, and they provided helpful feedback. Working from this, I changed a small but very important rule as they had misunderstood it during their session and it had skewed the results. I had never before entered the Hippodice Game Design Competition because I was usually able to send my prototypes directly to publishers, thanks to the contacts I made at the Göttingen Game Designers' Convention. But since we had what I thought was a very refined prototype and we had not yet found a publisher, I decided to send the game in. 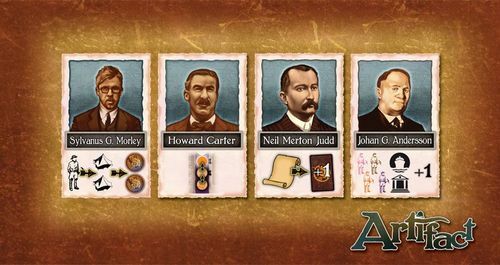 The following spring of 2009, we were excited to learn that Artifact had been one of six games chosen for the final round, along with Andreas Steding's prototype for Hansa Teutonica and the first-place design, Dwight Sullivan's Noblemen. This generated new interest by some publishers, who were on the jury for the final round. After having almost a whole year away from the game, however, I was motivated to tinker with the design again. I felt that our streamlined game, which had certainly become a more efficient design, was now lacking some thematic excitement and strategic variety. I added special cards to the mix of artifacts as well as bonus "research" points for digging at multiple sites instead of focusing at only one or two. I also replaced the wooden coins with a money track on the board and added points for cash left at the end of the game. Now research and money factored more prominently into the final scores, giving players more to think about without adding too much complexity. At that time, I saw that White Goblin Games in the Netherlands was building a reputation of releasing more complex games, so I took the initiative of pitching Artifact to them as well. They tested the game intensively right away and even suggested adding further layers of complexity. Their idea was to add four different archeologists and four different cities in which a player could move his marker each time he produced an exhibit. Each of these would then provide a unique privilege. This element gave experienced players the opportunity to choose specific strategies and to alter them with each new exhibit. The game was finally, at long last, "finished". However, because the base game worked fine – and was already highly regarded by the Hippodice jury – we decided to keep it separate in the rules from the archeologist and city "modules" that were added later for more theme and depth. Hopefully, this will keep new players from being overwhelmed with all of the choices until they are familiar with the core of the game. Experienced gamers, on the other hand, will no doubt be able to dive right into the complete game from the start. Although Artifact is definitely a "Eurogame" with lots of action tracks and tiles on the board, it stays true to the original inspiration and is fairly thematic. It does not have the high luck factor of some of the recent archeology-themed games, and there is plenty of depth to explore, especially with the complete game. I enjoy just about every archeology-themed game I have played and have most of them in my collection, and I can say with confidence that Artifact still adds something new to the genre. Furthermore, Bernd and I enjoyed working together on the long road to this game's publication. It was our first project together, we've enjoyed playing it together in every iteration over the past eight years, and we are excited to finally be able to share it with a larger audience.